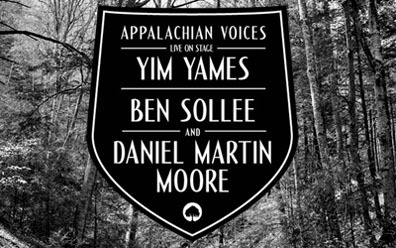 My Morning Jacket's Jim James (once again going under the name Yim Yames), cellist/vocalist Ben Sollee, and singer/songwriter Daniel Martin Moore will be on a nine-date "Appalachian Voices" tour in support of raising public awareness of Mountaintop Removal coal mining throughout Appalachia. This is the first time the three have performed together since the recording of Dear Companion, which was a collaborative album between Sollee and Moore that featured James and specifically aimed to draw attention to the problem of mountaintop removal coal mining and its impact on the culture and land of Appalachia. Portions of the proceeds from Dear Companion and this upcoming "Appalachian Voices" tour will go toward Appalachian Voices, which is an organization focused on ending mountaintop removal coal mining along with other environmental problems affecting the central and southern Appalachian Mountains. "The people and the land of Appalachia are too important to us as a nation to be sacrificed for something as short-sighted as Mountaintop Removal (MTR) coal mining," Sollee, Moore, and James stated in the press release. "Our cultural stake in the region, from its music to its log cabins, is an indispensable part of our history and identity as Americans. People all over the world know our country music, our dances and our stories and they call them American. They are the fruit of Appalachia. Learn more about MTR's destructive impact, and how we're all connected to it, at http://www.ILoveMountains.org."